I did not intend to make a new seat for this bike, at least not at first. 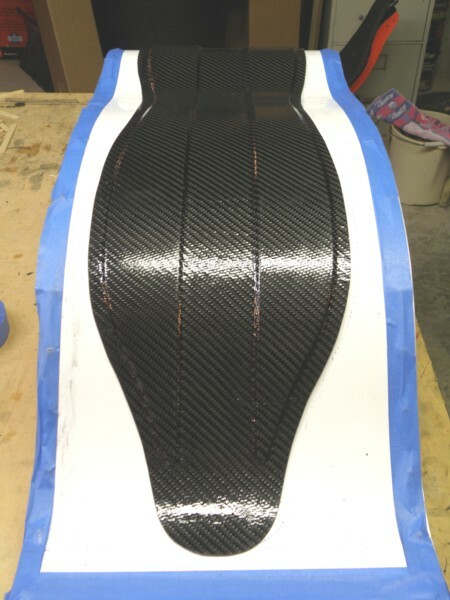 My real goal was to (eventually) make a carbon seat for my next bike, and the first step was to make a fiberglass prototype to test some ideas and improve my composite building skills. 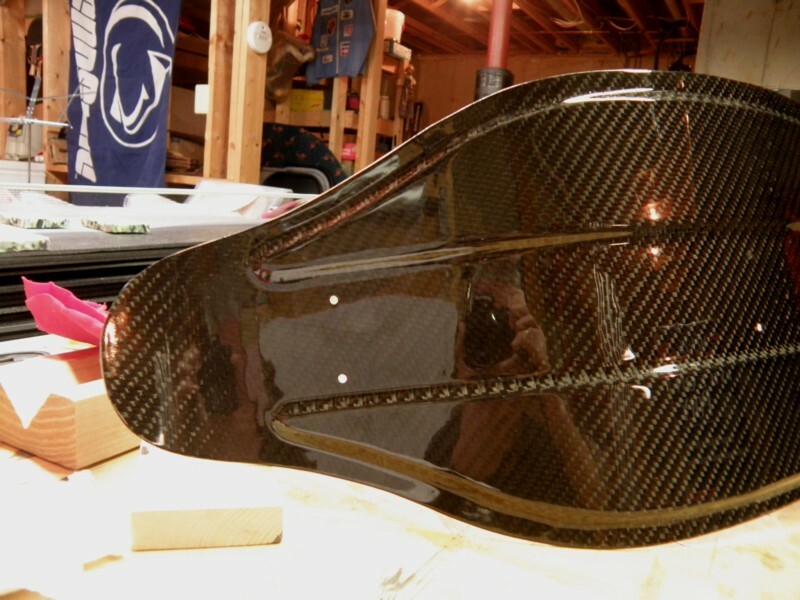 It was only after making the fiberglass prototype that I decided to make this carbon seat for the Mistress. 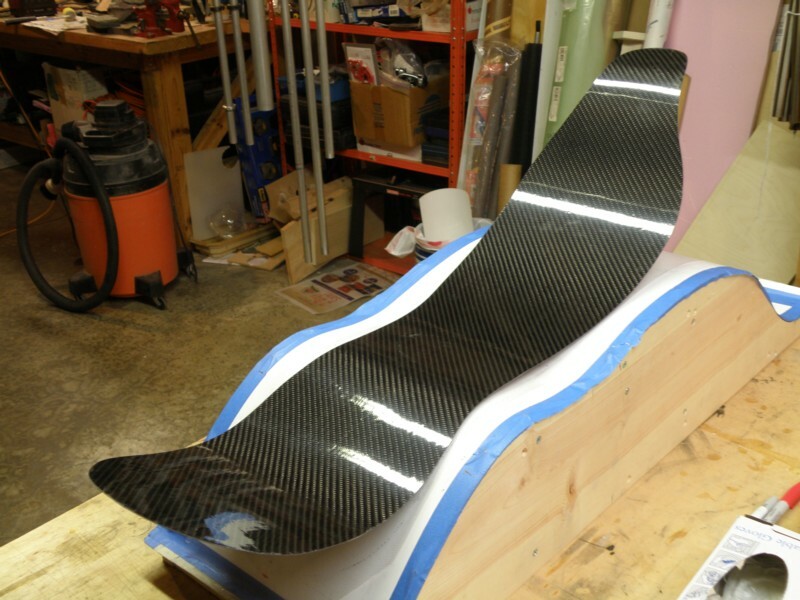 Below I describe making both the fiberglass prototype, as well as the carbon seat shown above. My plan was to build a male form for the top face of the seat, and build up the seat in layers on top of that form. I still had the templates I used for my Mistress frame, so I decided to use it as a template for my new form. After a trip to the hardware store for the lumber, I cajoled my son, home from school for winter break, into helping me build the form. We traced the profile onto two 1x10 pine boards and cut out the rough shape with the jigsaw. We temporarily screwed the two boards together and sanded them to the exact profile using the drum sander attachment on the drill press. After sanding the profile just right, we assembled the form using 1x12 pine boards between to two profiles. Just about the time we got to this point, my son got a text and says to me, "Uh, Dad, I was planning to go to the movies, do you mind?" Frankly, I was happy our "quality time" had lasted as long as it did. I screwed a sheet of aluminum to the form. Form completed, on to the fiberglass prototype! 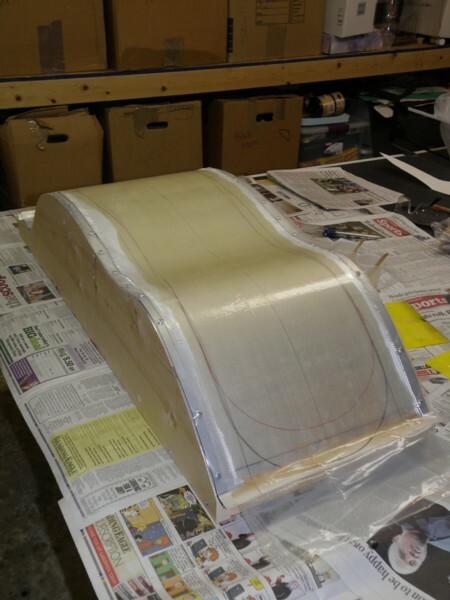 Here I've applied the first two layers of fiberglass. It's a plain weave that seems to be about 6 oz/square yard. 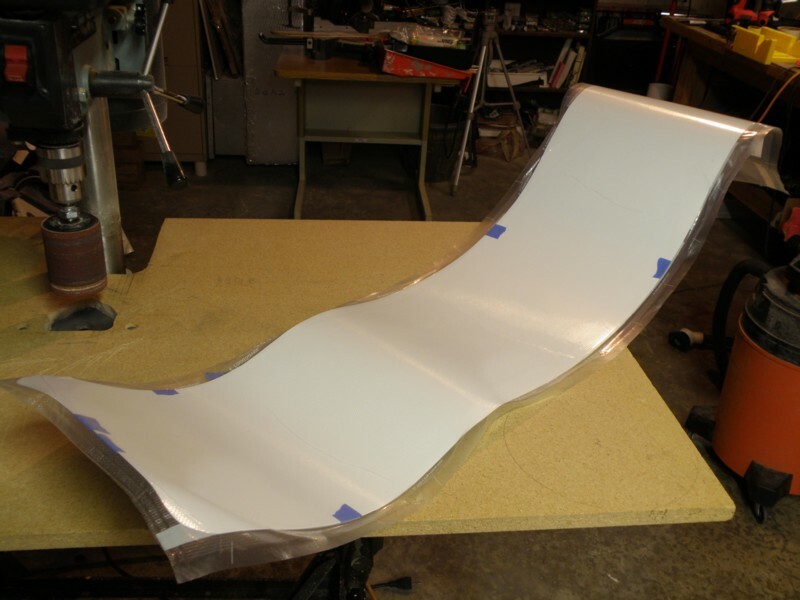 Before wetting out the fiberglass with epoxy, I used spray adhesive to attach a sheet of 2 mil (0.002 in) clear plastic sheet to the aluminum sheet, to keep the epoxy from sticking to the aluminum form. I needed some help applying the plastic sheet without two many wrinkles and bubbles, so this time I enlisted my daughter, also home from school for Christmas break. This was turning into a real family affair! 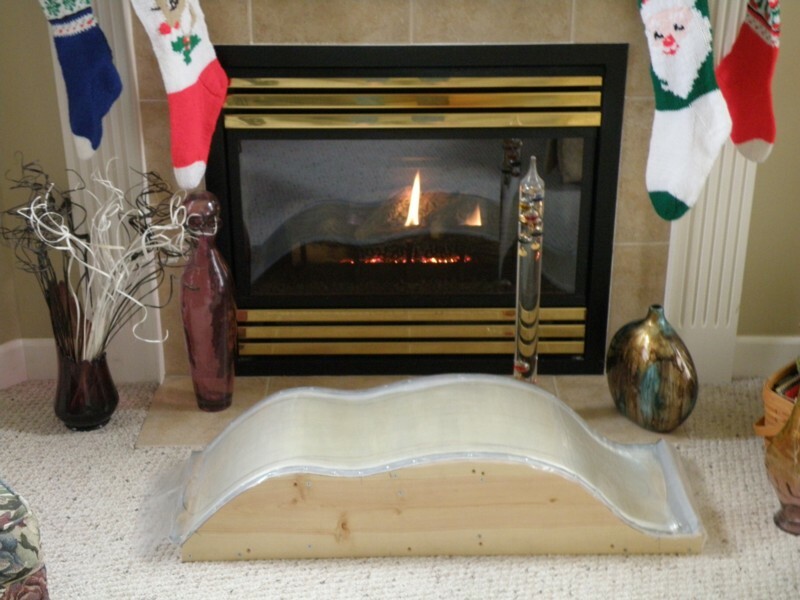 I cut out two 40" x 11" pieces of the fiberglass cloth and laid them both on top of the form. I then mixed the epoxy, drizzled it onto the cloth, and spread it around with a plastic squeegee as it soaked into the cloth. I used West Systems 105 Epoxy with 206 hardener for this project. One really nice thing about fiberglass, unlike carbon fiber, is that it becomes transparent when it is wet out with epoxy. That really helps you to know whether or not you have saturated the fibers with epoxy. Notice the two outlines (one red, one black) of the seat shape in these images. Those outlines were actually drawn directly on the aluminum sheet, but you can see them right through the layers of fiberglass and plastic. After the fiberglass was completely wet out, I placed another layer of the plastic sheet on top and dragged the squeegee across the plastic to remove excess epoxy. I could have done the same thing without the extra plastic layer, but it allowed me to squeegee a little more aggressively than I would have otherwise. My basement workshop is only about 60 F, which gives me more working time with the epoxy, but makes for slow curing. So I put in front of the fireplace for a little boost. Next it was time for ribs. 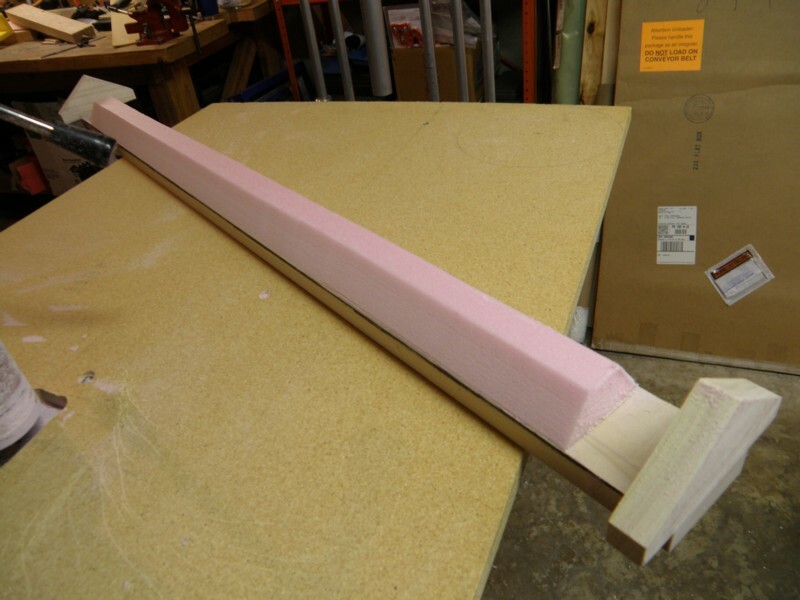 I used the wood form shown here to make foam ribs. The foam is one inch thick Owens Corning polystyrene insulating foam. I cut a piece about 3 inches wide and used spray adhesive to attach it to the form. Then I sanded it down to the width of the form (2.5 inches) using the drum sander. Finally I turned the form upside down and sanded down the corners to make the trapezoidal profile. The result was a trapezoidal profile 2.5 inches wide at the base, about 1.1 inches wide at the top, and one inch thick. 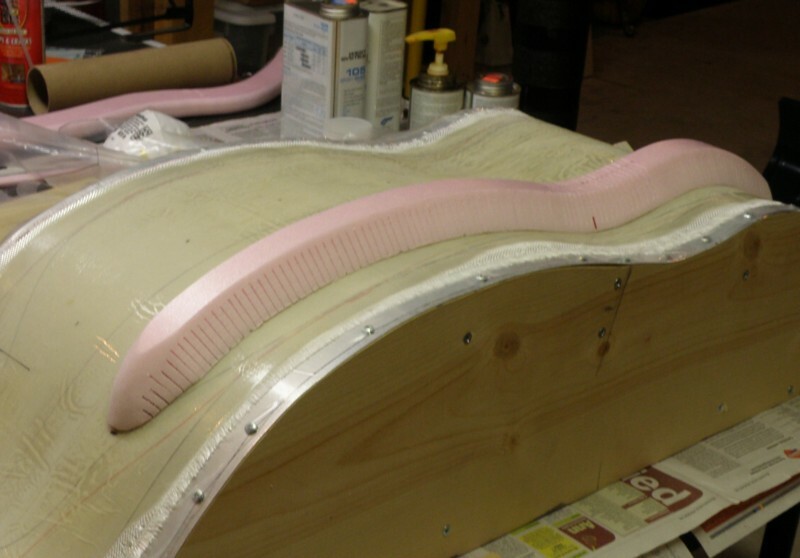 The pink foam is really stiff, so for it to conform to the curves of the seat, I cut a series of slits in the foam, on the compression side of each curve. Cutting the slits was tedious, and a bit nerve wracking, since the rib got pretty flimsy and fragile with all the slits. 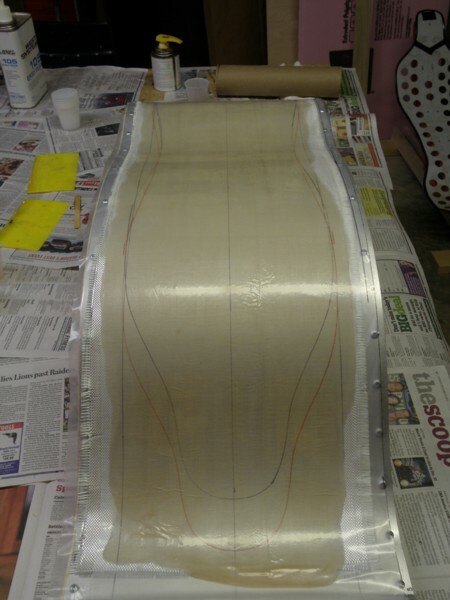 After cutting all the slits, I epoxied the rib to the fiberglass. I used a bunch of strips of plastic and tape as straps to hold the rib in place while it cured (not shown). Next I added fiberglass layers on top of the rib. First I added a 0/90 strip about 1.5 inches wide directly on top of the foam rib, then added a bias cut (45/45) layer of cloth on top of that, this layer covering the rib as well as that entire side of the seat from the seat edge to just over the center line. I used a bias cut layer here to allow the cloth to conform to the compound curves of the rib and seat, and was happily surprised at just how easily it worked. For both the initial 0/90 strip and the final 45/45 layer, I wet out the cloth with epoxy between two layers of clear plastic sheet before transferring the cloth to the rib. I wet out the two cloths separately, but applied them in the same step. That is, I applied the 45/45 layer on top of the still wet (uncured) 0/90 strip. After the layers were partially cured (leathery), I used a knife to trim the excess cloth that overlapped the centerline. 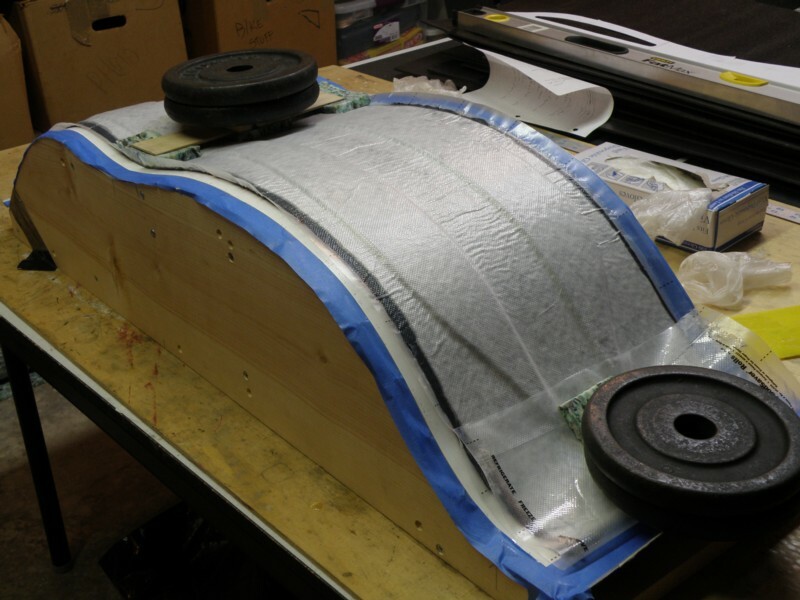 Here I've added the second rib and layers of fiberglass, just like for the first rib. Finished prototype. I had actually planned on another layer of cloth on the back, but decided to remove it from the form and feel how stiff and heavy it was. I was happily surprised at how light it felt. Earlier I was afraid I had used too much epoxy but this thing felt like a feather. But at the same time, it felt remarkably rigid, at least the ribbed area did. On the other hand, the top and bottom ends, which extended beyond the ribs, were remarkably floppy. Overall, I was pleased with how this prototype turned out. 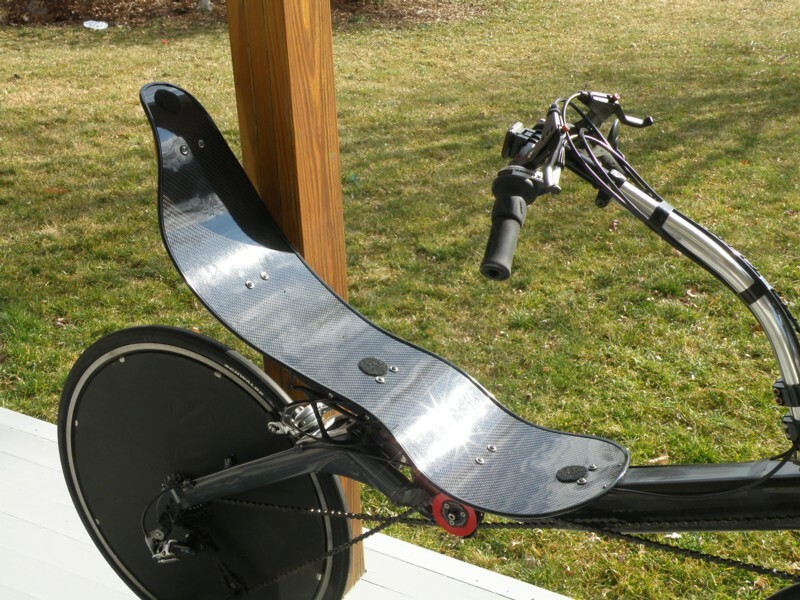 Honestly, I know this prototype is not stiff enough or strong enough to be a functional seat for a typical recumbent design. 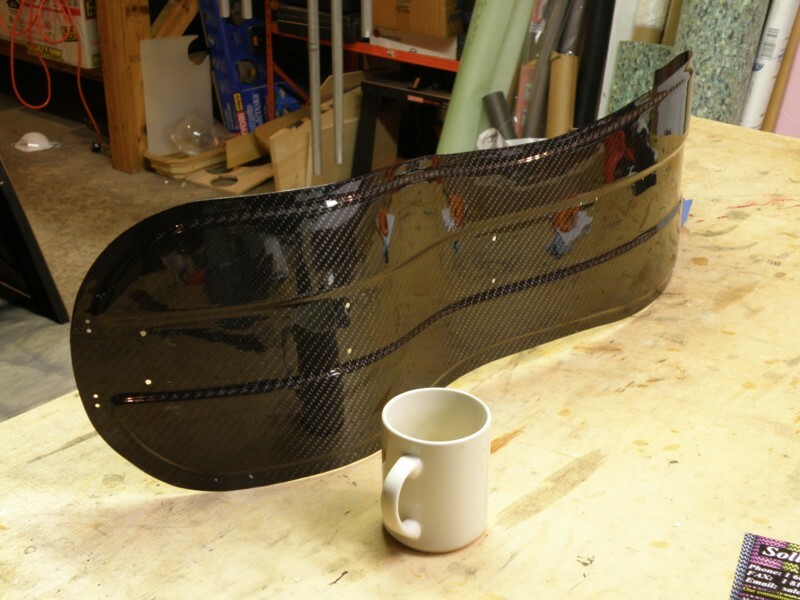 But it left me feeling pretty good about the possibility of building my own carbon fiber seat that would be plenty stiff and strong, and be as light as most any commercial carbon seat. 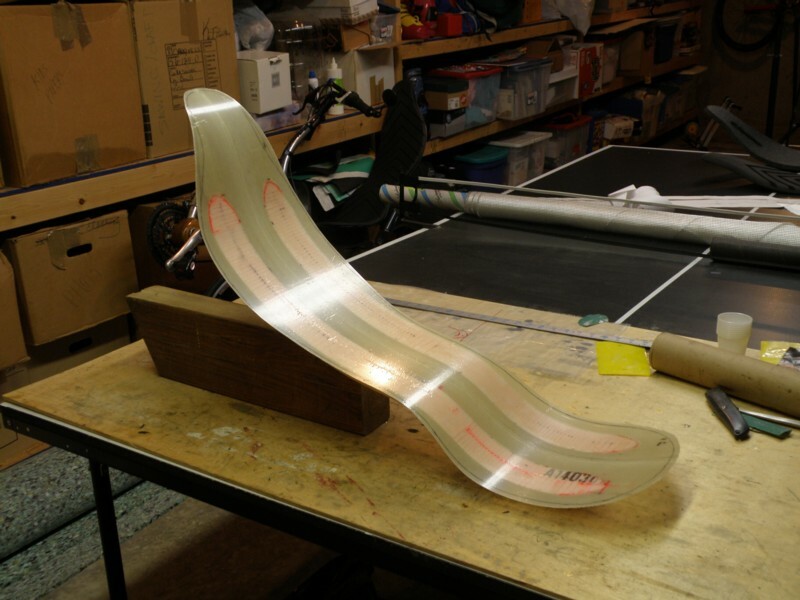 I'm still thinking about exactly how I might use this fiberglass prototype in the future. Most likely, it will just be another piece in my museum of practice pieces. 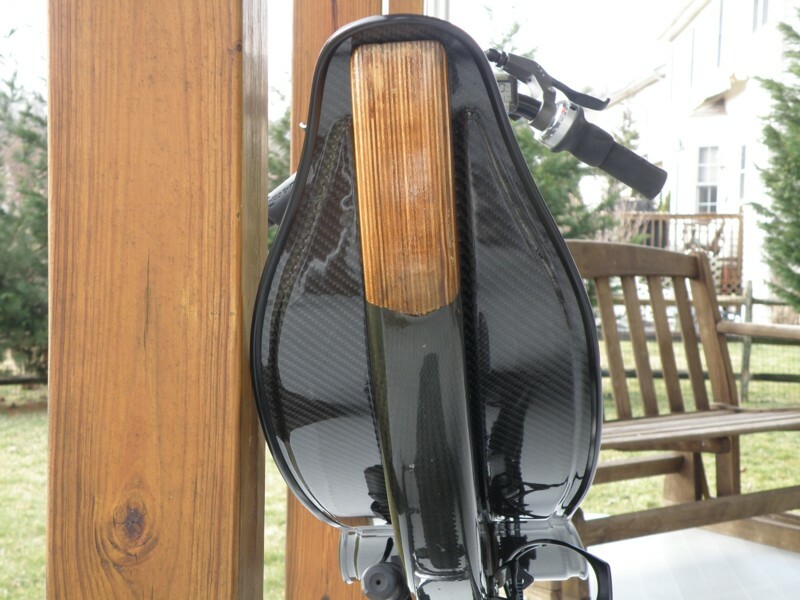 On the other hand, I could use it as a male plug for building a future carbon fiber seat. 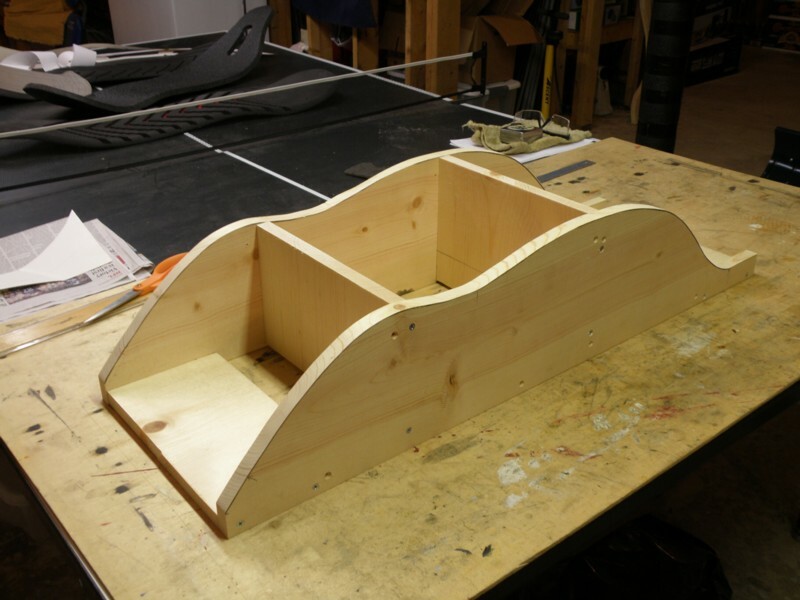 If I do, I'll probably need to extend the ribs a bit higher up the headrest portion of the seat, and maybe a bit closer to the bottom edge as well. We'll see if I ever do. 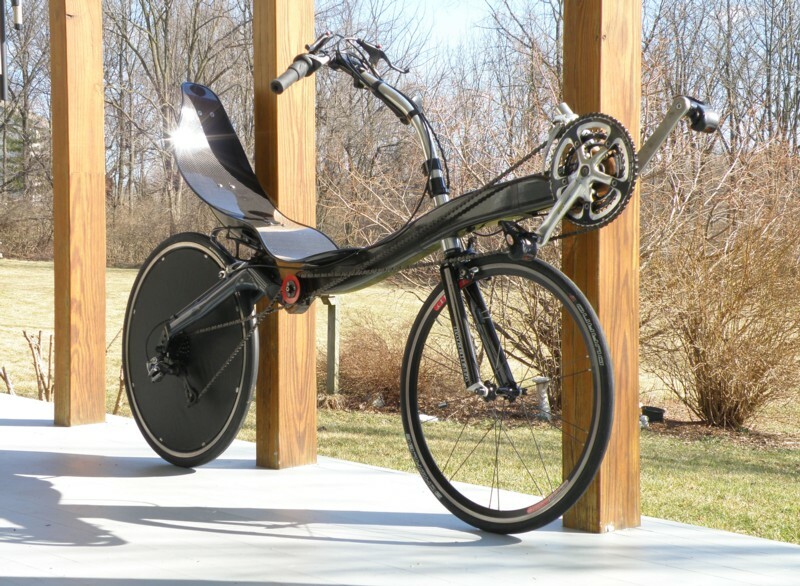 The design of my next bike was still percolating in my mind, so I was not quite ready to build "that" seat, but I was too excited about the success of my prototype that I had to build something. It only then occurred to me to build a carbon seat for the Mistress. Frankly, there was not really much justification for it. 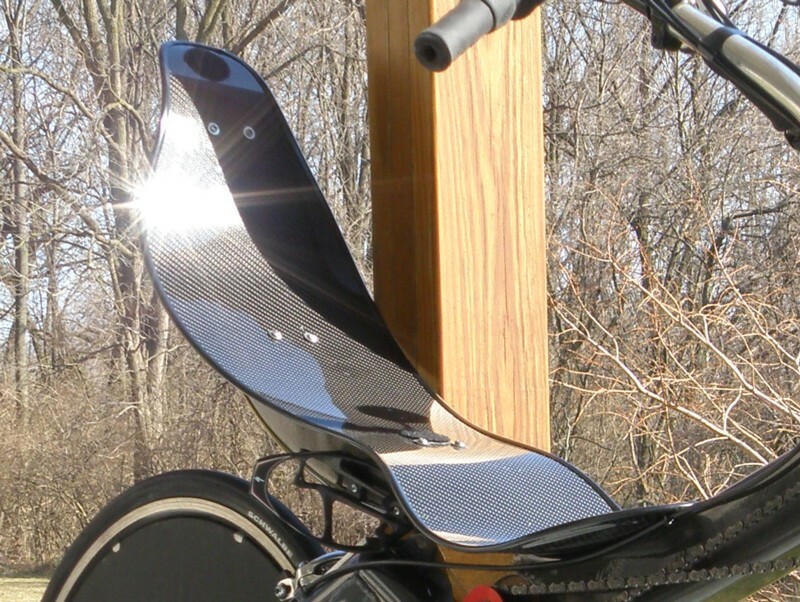 The aluminum seat it already had was perfectly functional, decent looking, and pretty light. I had never weighed it, but based on its dimensions and the density of aluminum, I estimated its weight to be only about 1 lb (450 g). So, frankly there was not much to be gained. On the other hand, carbon does have more cache than aluminum, and I was eager to make something! 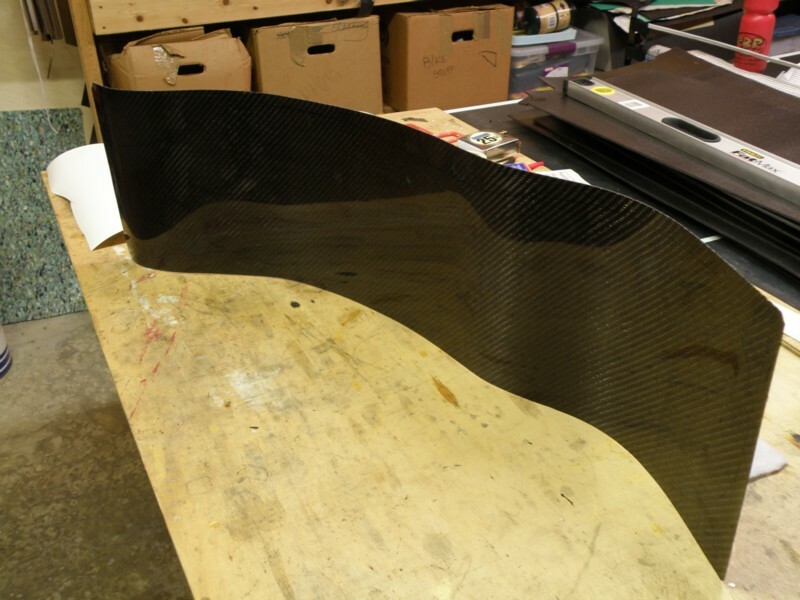 I ordered some carbon fabric from Soller Composites. The fabric I picked was a 6K, 11 oz/square yard, 2x2 twill with a nominal cured thickness of 15 mils (0.015 inch). I planned to use the same epoxy (West Systems 105), but this time ordered the special 207 hardener, which is non-yellowing and UV resistant. 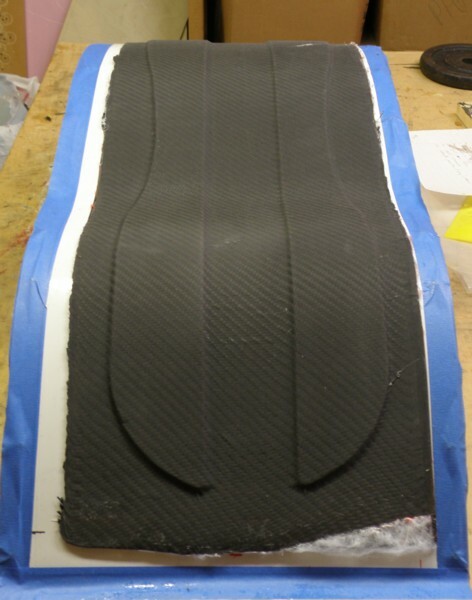 My plan for the Mistress seat was to simply use two layers of the carbon fabric, sandwiching a pair of shallow but wide foam ribs. Since the Mistress frame supports the seat, I probably could have gotten away without any ribs at all. 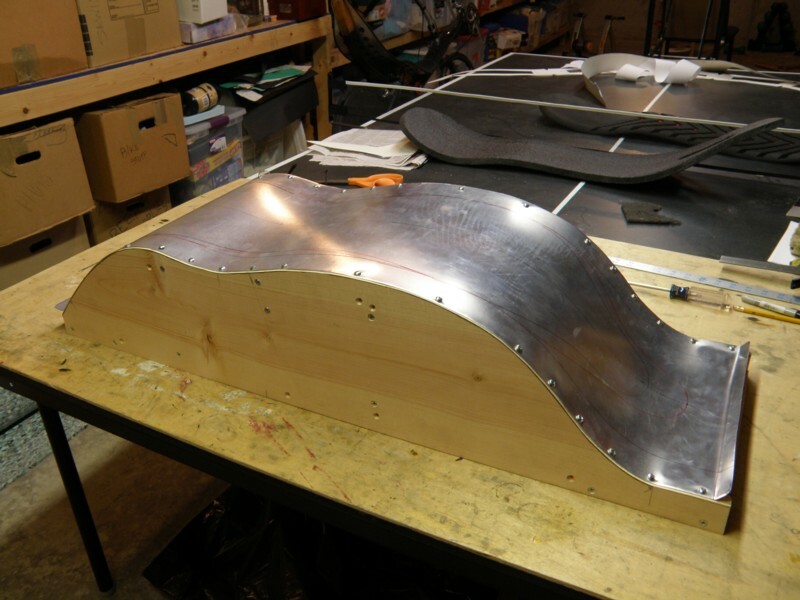 But there would have been no challenge in that, and I figured that a shallow rib would at least give the seat a little more body and stiffness, while also looking more professional than a simple flat seat. 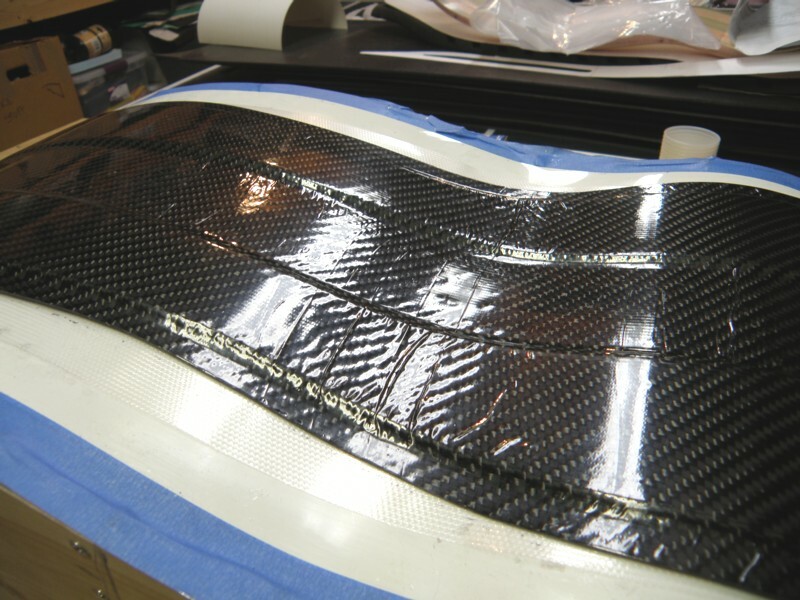 The image above shows the first layer of carbon wet out with epoxy. I did this a little differently than for the fiberglass seat. Firstly, I replaced the 2 mil plastic I had on top of the aluminum with a much heavier (15 mil) sheet of white, glossy, plastic. 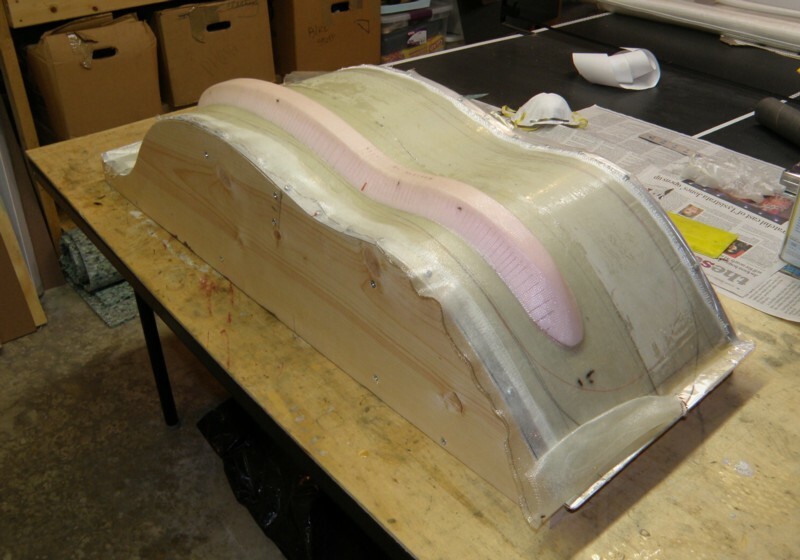 The 2 mil plastic had wrinkles and creases in it which had transferred to the surface of the fiberglass seat. The thicker plastic was quite rigid and free from wrinkles and creases, so I thought it would make for a nicer finished surface. Also, this time I wet out the carbon fabric with epoxy between two sheets of clear plastic before transferring it to the form. I was afraid that if I applied the epoxy directly to the fabric on top of the form, I could not be sure if I had wet the fabric thoroughly. By doing it between clear plastic sheets, I could at least tell that both surfaces were thoroughly saturated. After the fabric was wet out, I peeled off one layer of the clear plastic, laid the fabric onto the form, and then peeled off the second layer of plastic. 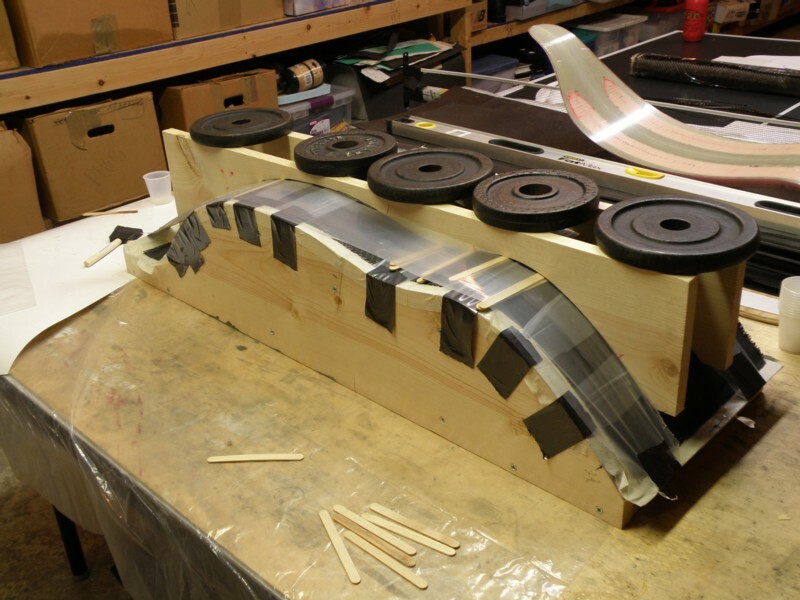 Then I applied a layer of "peel-ply" polyester fabric on top of the carbon. 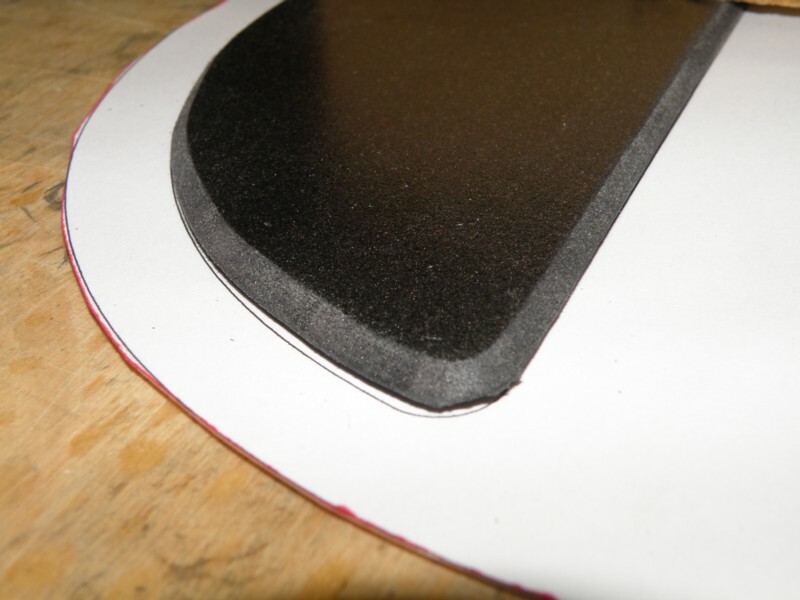 The purpose of the peel-ply is to leave a textured surface to which subsequent layers of carbon can be added without sanding in between. The fabric is light blue, which you can see along the sides of the seat in the image above. There wasn't enough epoxy on the surface to wet out the peel ply, so I had to add a bit more epoxy on top. 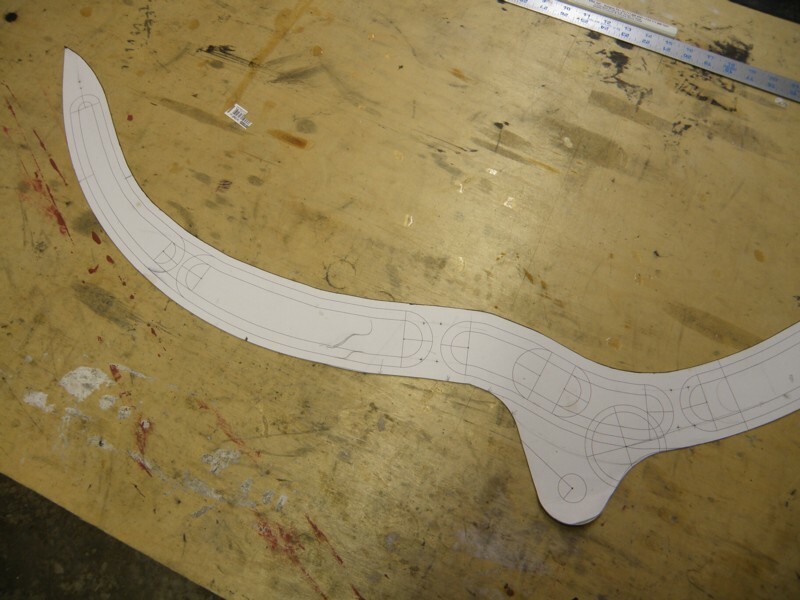 Then I made this paper and posterboard template for the seat shape. For the fiberglass prototype, I just traced my old seatpad to get the shape, but this time I wanted a proper CAD drawing of the seat, mainly to allow me to make a template for the ribs. 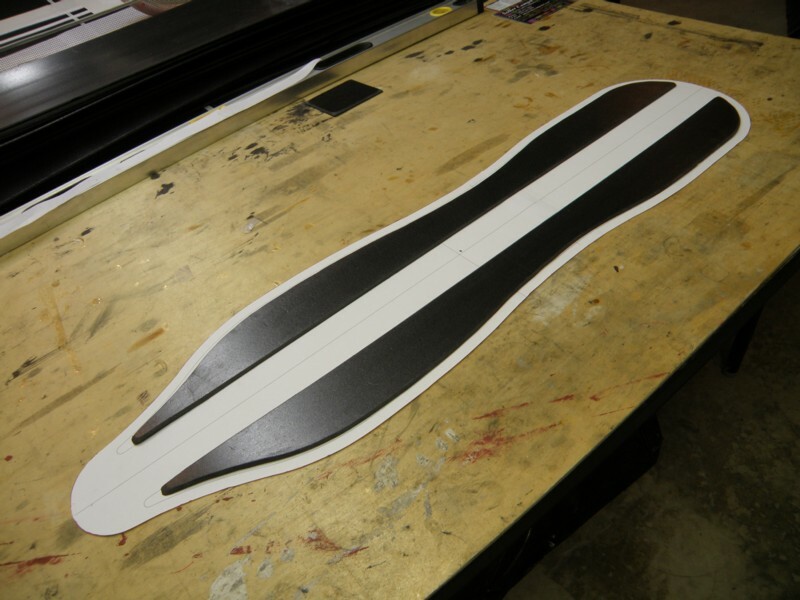 I cut out this plywood form and used it to shape the foam for the ribs. I used polystyrene foam about 1/8 inch thick. Here are both polystyrene foam ribs. I used my router with a 45 degree bit to bevel the edges of the foam ribs. 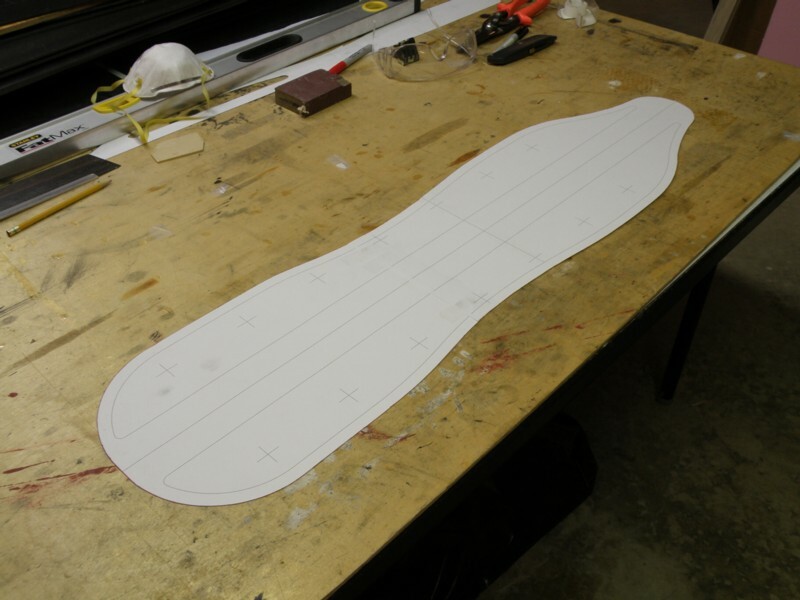 The plywood template served to guide the router bit. 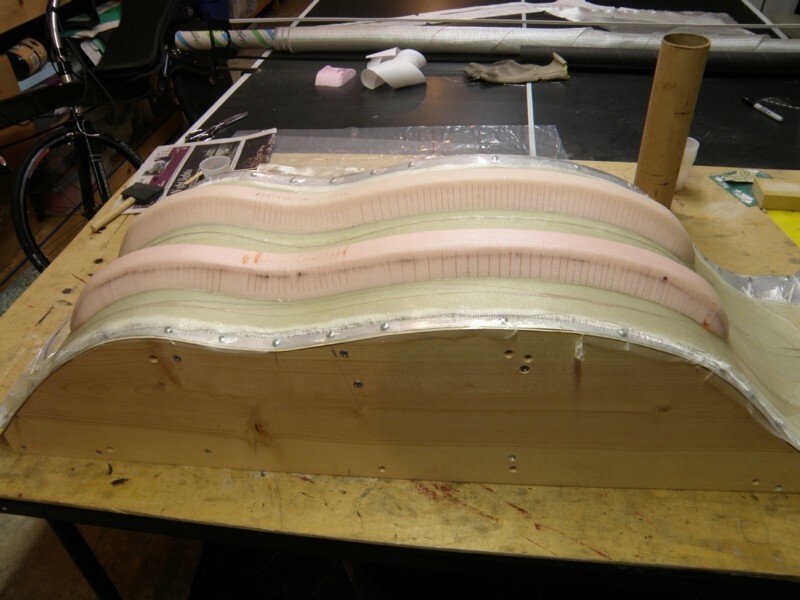 Then I epoxied the two polystyrene ribs to the seat and held them in place with all manner of straps and weights. Ribs epoxied in place. Now it was decision time. 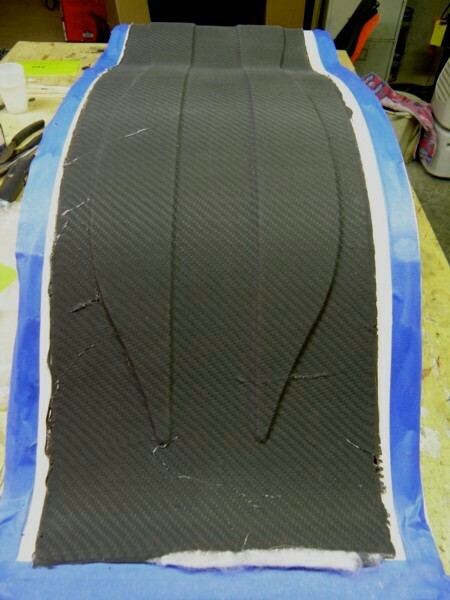 I considered simply adding the second carbon layer directly on top of the ribs with the whole thing still on the mold. 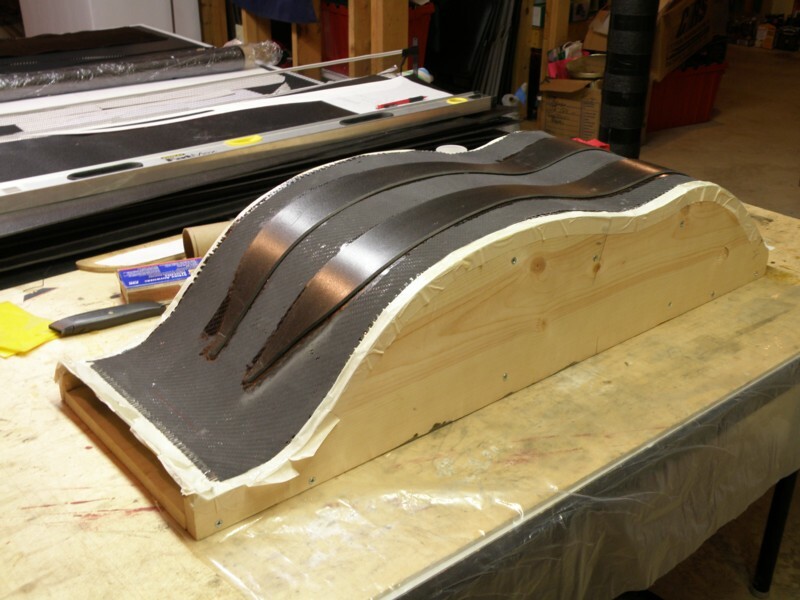 On the other hand, I felt it would be preferable to use some vacuum to pull the second layer tightly to the ribs and ensure a great bond to the the first carbon layer, but to do that would require removing the seat from the mold now, before it had any real rigidity to the structure. To vacuum, or not to vacuum, that was the question. To help me decide, I made a little test piece to see how well the carbon fabric would conform to the rib shape without any vacuum. It didn't. So it was clear that I'd need to use vacuum. So I peeled the seat from the mold, and was excited to see that the surface that had been against the mold was gorgeous. Well, mostly anyway. 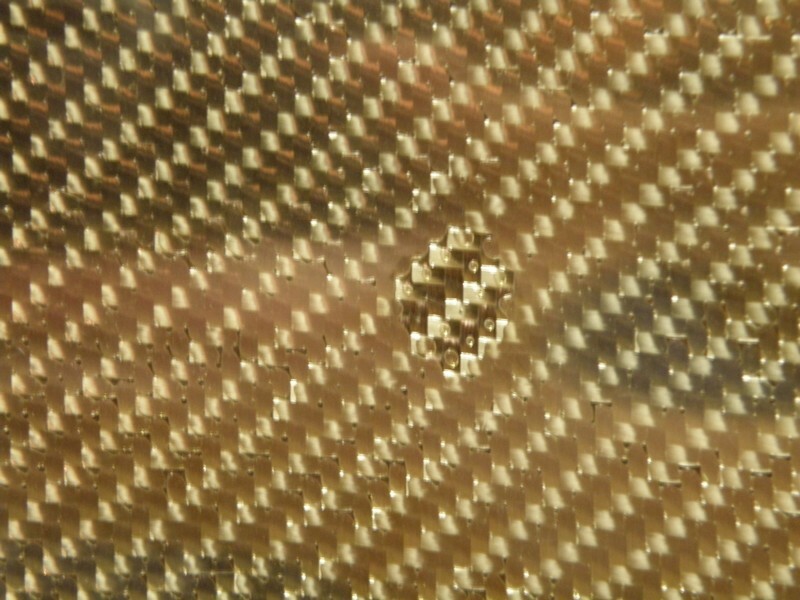 As you can tell from the image above, the smooth glossy surface of the new plastic sheet transferred directly to the surface of the carbon, and it looked great. Better than I imagined it could, in fact. Except that there were a few areas where the fabric was apparently a little starved of epoxy, and those didn't look so good. 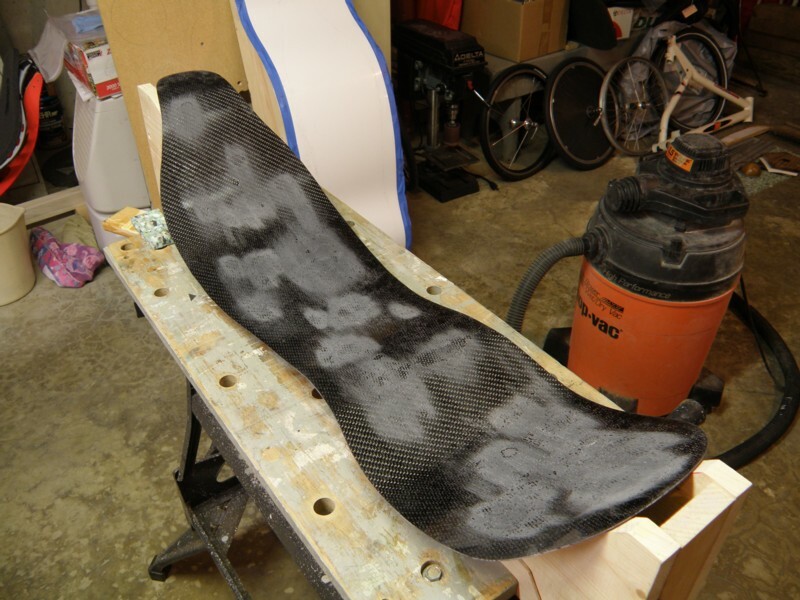 Apparently, way back when I peeled the clear plastic off the carbon fabric before applying it to the mold, just a bit too much of the epoxy went with it, leaving a few areas a little bit dry. Too bad, it was almost perfect. This shows a close up of one of the areas that was starved of epoxy. This would be addressed eventually. 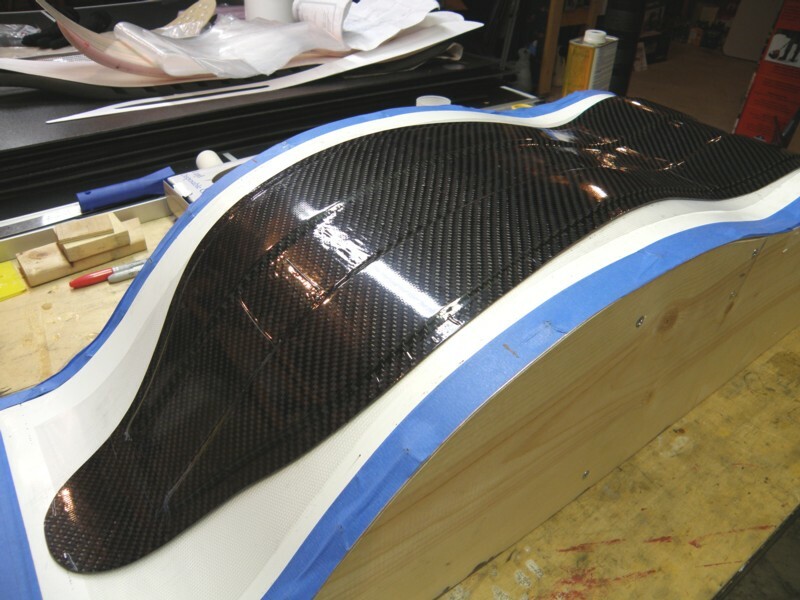 But the immediate job was to apply the second layer of carbon on top of the ribs. Here it is with the second layer applied and all bagged up. As in building my original Mistress frame, I again used the Foodsaver vacuum bags and pump to provide my vacuum. The Foodsaver bag is only about 10.5 inches wide on the inside, so I trimmed the seat down to about 10.25 inches wide to allow it to fit inside. The final seat width was to be about 9.125 inches. 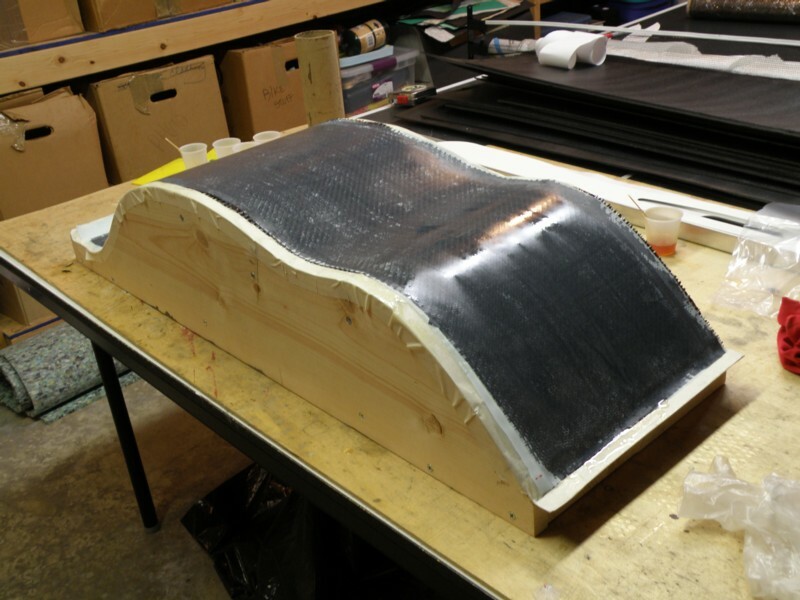 I wet out the carbon, but this time between one sheet of plastic and one layer of peel-ply fabric. 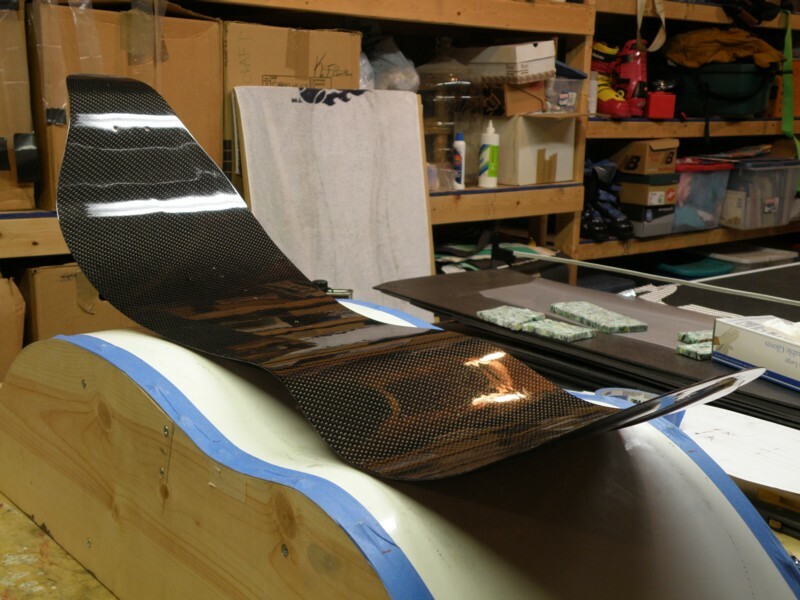 Before applying the wet out carbon on top of the ribs, I painted a layer of epoxy on top of the ribs and exposed carbon to ensure that interface would have plenty of epoxy and make a good bond. I added a layer of breather batting (the white stuff in the picture) and loosely taped it in place. I needed help for the next part, and this time it was my lovely wife that I enlisted. I had a feeling that sliding the seat (with new carbon plus batting) into the long narrow bag would not be easy. So we actually practiced our technique before applying the carbon cloth and batting layers in hopes that we would not fumble around too much once that carbon was in place. The practice run went smoothly. The real thing, not so much. After sliding it in about halfway, it was not so eager to go farther. My instinct was to push harder! It went in a bit farther, but not much. So I pushed even harder, and it went in a bit farther, but now batting was bunching up, and presumably doing the same thing to the carbon fabric underneath. Crap. Luckily my wife, not being as tense about the whole thing as me, realized that shimmying bag from the far end was much more effective than just ramming it in from the front. That way we managed to get it fully inside the bag, and I was able to reach in afterwards and smooth out some of the bunching my method had caused. I turned on the Foodsaver machine to pull the vacuum and seal the bag. After letting it cure overnight, and removing the batting and peel-ply, it looked like this. The lower portion was virtually perfect, while the upper portion had a few, relatively minor wrinkles. I was relieved to see that. The image on the left shows it after I sanded out the wrinkles. 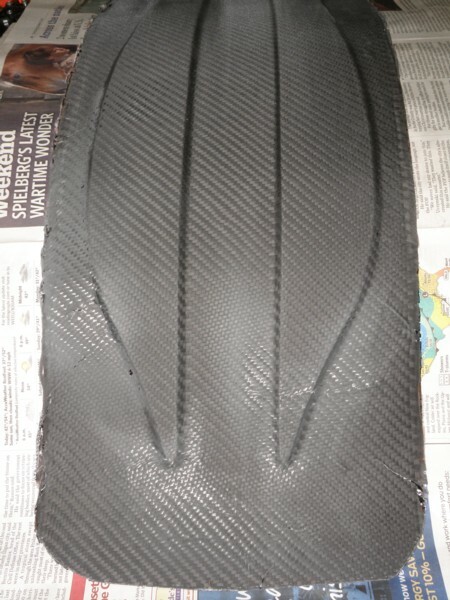 I had to sand into the carbon a bit, to smooth it out, but not too deeply, it seemed. 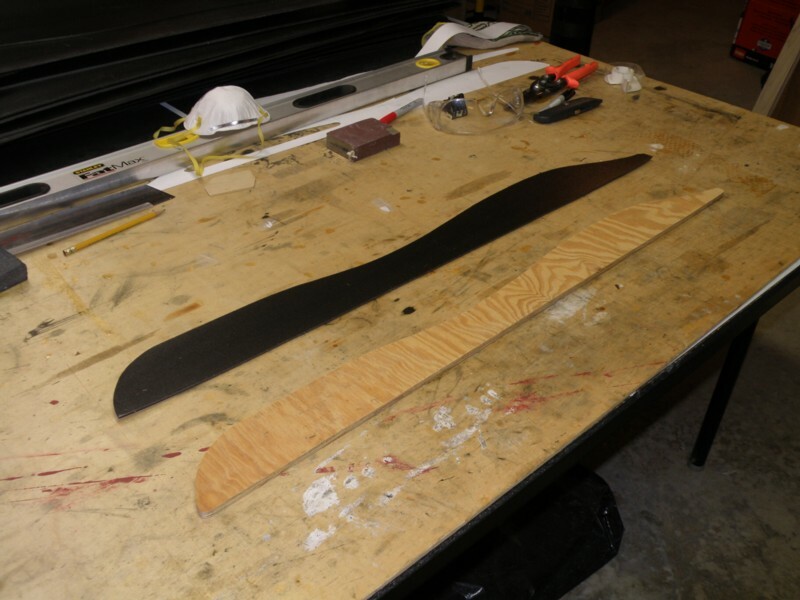 On the right, I have trimmed the seat to the final shape, and painted a layer of epoxy over the back surface. By "painting", I mean I spread a thin layer of epoxy using a foam brush. Then I turned my attention to the front surface, and those spots that were starved. I sanded the entire surface, especially around the starved areas, then painted on a layer of epoxy. With the epoxy still wet, I rolled a piece of my smooth, glossy, thick white plastic on top of the epoxy and vacuum bagged it. Unfortunately, it made it worse. There were still good spots, but there were several areas where bubbles of air were trapped, leaving craters in the surface. I sanded them out and tried a second time. This time, I used a rolling pin to try and eliminate any trapped bubbles. It worked better than the first attempt, but still left bubbles. The big problem, I realized, was that I could not see the bubbles through the white plastic, so I was working blindly. For the third try, I used a piece of clear plastic instead of the white plastic. Rather than using the wrinkled and creased plastic sheet I had on hand, I cut a Foodsaver vacuum bag apart and used the smooth side of the bag (one side has ridges to help channel air flow, but the other side is smooth). This time, after painting on an epoxy layer and applying the plastic on top, I used my plastic squeegee to work out all the bubbles. This worked beautifully. It had been my intention to vacuum bag it after pushing all the bubbles out, but I realized that was unnecessary. After letting it cure and peeling off the plastic, it looked like this. Ah, much better. Then it was time to obsess over the other side. So, now I understood that the trick to a great surface was to let the epoxy cure against a nice smooth film, with all the trapped bubbles removed. But his would be a bit more difficult on the back side, due to the ribs. I got pretty good results, however, on the ribbed side of the seat by painting the surface with epoxy, then vacuum bagging the seat with the smooth side of the Foodsaver bag against the ribbed surface, and using the squeegee to push all the bubbles off the edge. It would have been difficult (maybe impossible) to paint the entire back surface with epoxy and manage to slide it all the way into the bag. But I was able to do it in two separate steps. First applying epoxy only to the lower part of the seat, sliding it into the bag top end first. After letting it cure, I repeating the process with the upper part of the seat. This strategy provided a very smooth and wrinkle free surface over most of the back surface of the seat. The area shown here was one area that had the worst wrinkles. But I knew I would be able to sand them smooth. Yes, that is a bit of blood. Gross, I know. About this time I had rediscovered wet sanding. Wet sanding eliminates all the dust which is a very good thing, and was also less abusive to my hands. But, by this time I had done enough dry sanding that my fingertips were worn thin, and even wet sanding was more than they could take. After wet sanding both front and back with a series of grits (as fine as 2000), I planned to finish up with a few coats of spray polyurethane. I tried several different brands, but they all left a slightly textured surface. Not terrible, but not what I was hoping for. Finally, I tried a "wipe-on" polyurethane (Minwax) that did a great job. I put 3 or 4 coats on both sides and was finally happy with the finish. And another shot of the finished front side. And finally mounted on the bike, with the door edge molding added to protect the edges. Finished weight was 350 grams, but 400 grams including the edge molding. A whopping 50 grams lighter than the original! In the sun, with a few velcro circles to secure the seatpad. But I don't want to cover it up! Copyright © 2006 Carbon Bent. All Rights Reserved.